Anthony Graham came to Madison in 2009 for his first PSA event ever and has been back 3 more times. This is his first time making to the final though. 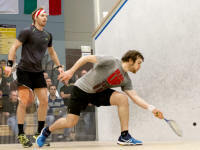 Angus Gillam’s sixth PSA final. The unfortunate news for him is that he has lost the previous 5 times. The Madison crowd is looking for a fun game from these two young English players, and the bleachers are packed despite the match overlapping the Green Bay Packers game! Both players started the game well, varying the pace and using all angles of the court. In spite of the many drops and hard low shots, there were no unforced error till Angus was up 6/4. Anthony then made two unforced errors in a row, which ended up being too costly for him and he lost the game 11/5. In the second, an unforced error by Angus, followed by a nice flick by Anthony, and Anthony is up 2/0. A humongous rally follows, with unbelievable retrieving by Angus, and it is Anthony up 3/0. He is trying to be more attacking with his shots, and Angus is doing a lot of retrieving. Either Angus will run out of gas, or Anthony will pay for his unforced errors. Either way, this is fun to watch! Anthony is leading, but gets into an argument with the referee. In the middle of a long rally and as he is running to the back of the court to retrieve Angus’s lob, he is looking at the referee instead of the ball. That never works well. At 8/9 down he has a stroke called against him for his watch falling off in the middle of the point. He goes on to lose a game he really should have won. Not sure exactly why, but Anthony seemed to lose interest in the game, and Angus won the third11/0. The crowd would have loved to see more squash, particularly as Anthony has showed he has a fantastic armamentarium of flicks and drops, and constantly was able to anticipate Angus’s shots. As Angus noted in the post-match interview, he had to change his game to adapt to Anthony’s attacking squash. It was a great match--even the 11/0 third game was entertaining! Thanks to Angus , Anthony, and all the players for a great tournament, and a huge thanks to Damon Bourne and Jonas Laursen for a great tournament. The first semi-final, Anthony Graham v Amyr Evans, got a little testy with some discussions with the referee. Both players not getting the calls they wanted. Some fishing by both players didn't help the situation, but Graham was able to keep focused enough while not playing his best squash of the tournament to take the win in three tightly contested games. The highly anticipated late match featured Angus Gillams' raw athleticism versus Hamzah Bukhari's elastic movement and clever shot making. Some animated discussions with the ref due to some traffic issues on the right side of court made for a tense environment, but the match was hard fought by both players with very entertaining all-court rallies. Towards the end of the third, Bukhari had to stop for a three-minute injury break to deal with a slightly rolled ankle, but he played on and managed to squeak it out 11-8 to extend the match. Both players were a bit tentative at the beginning of the 4th, but Gillams got on a small roll and rattled off 4 points in a row to pull ahead 5-3. The 22 year-old from Lahore was not finished yet and ran off 4 points of his own to go ahead 7-5. Two more to Gillams. One to Bukhari. Then Gillams hunkered down and closed out the Pakistani 11-8 after a few more decisions and some frenetic playing. The first game was full of longer rallies on the conservative side with each player establishing their length. Opportunities to attack were generated by tight shots resulting in squeezed replies into the mid court. Graham just got the better of these exchanges and took a hard fought 1st game 12-10. The second game was full of more attacking squash and the front left corner was the focus. Again Graham prevailed at 11-7. 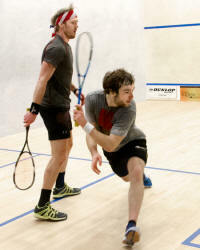 The third game saw Phillips seem to tire a bit and Graham pressed his advantage to 11-2 and a 3-0 win. Interesting first game with the big man from the Cayman Islands, Cameron Stafford squeaking it out 12-10 using creative flicks and holds that Emyr Evans could just not able to keep up with. That said, at the end of the game, somehow Stafford looked a bit worse for wear. Next game 11-3 to the quiet, patient Welshman who applied consistent pressure and kept the errors to a minimum. More of the same the next two games and Evans takes the win 11-6, 11-9. Entertaining match from the catlike Hamzah Bukhari. Incredible retrieving and creative shot making kept the Guatemalan on the losing end of this battle. 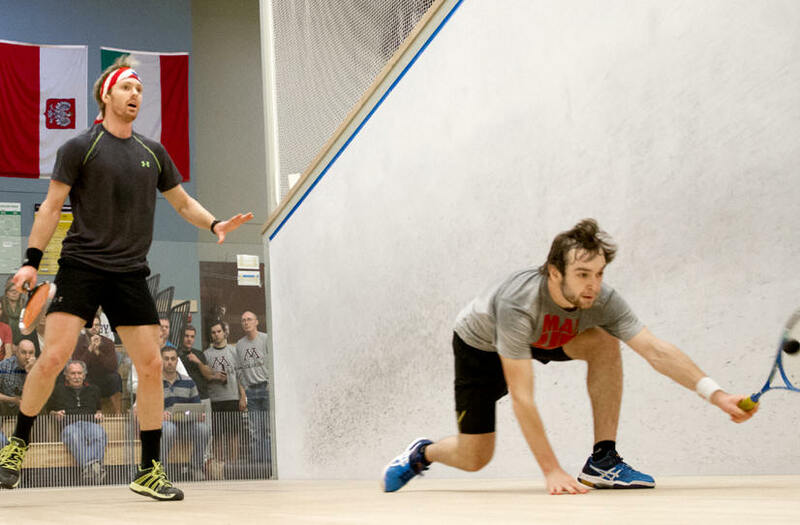 The final game, was played in front of a packed gallery as the other late match was finished and a determined Bonatti fought incredibly hard to come back from a 5-9 deficit to tie it at 9 all before running out of steam.